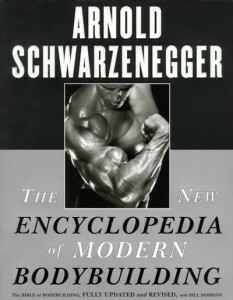 The best bodybuilding book I have read so far is Arnold Schwarzenegger’s Encyclopedia of Modern Bodybuilding. (You can buy the book from the link above, which helps me fund this website and write more reviews!) The principles in it are for anyone, from the scrawny kid trying to get big to world class bodybuilding competitors. My goals were to be thin, lean and properly proportioned. Arnold Schwarzenegger’s workout routines helped get me there. Arnold goes over proper techniques of lifting and addresses other concepts on how to look your best. After reading Arnold’s book you will break plateaus and increase lean muscle mass. Refer to it frequently and you will soon be training like Arnold himself. The mere presence of Arnold’s bodybuilding book on your night stand or dinning room table will inspire you to work out to your maximum potential. The insights and pictures will motivate you to become respected at the gym and gawked at on the beach. You can be as lean as Arnold and the other guys in The Encyclopedia of Modern Bodybuilding. The insights in this book will change your figure and your life. Your biggest gains won’t be from any pre-workout supplements or protein powder, but from practicing the fundamentals found in The New Encyclopedia of Modern Bodybuilding. Buy it now through the link provided in this article. This entry was posted in Bodybuilding, Workout Routine and tagged best workout, bodybuilding by Russell Jensen. Bookmark the permalink. That is a good question that I personally don’t have the answer to… I hope some people who read this post would be kind enough to shed some light on the subject.